We offer handpicked Villas for rent in Pula, with prices starting from 23 € per night per person. With the help of Villsy.com you can book your private villa with pool in Pula. Contact us via phone or form if you need more information. 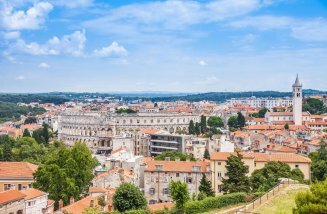 Slowly but surely Pula has become a popular destination in Croatia. Pula is located on the peninsula of Istria in the north of Croatia. The small enchanting city by the sea inspires its visitors with great cafes, restaurants and small bays with crystal clear water for swimming. The city scores with its beautiful landscape and creates a very special flair with its cultural side. Here you can go on sightseeing and spend long afternoons in cafes. In addition, you can enjoy the culinary specialties of Croatia in Pula! In the numerous restaurants you will find local dishes that will delight the palate. To help you enjoy your holiday in Pula to the fullest, villsy.com offers you first class holiday villas with pool! Here you will find various holiday villas in Pula! There is something for everyone - be it a villa with a pool for a family holiday or a holiday villa for a nice holiday for two. Our holiday villas with pool in Pula have been carefully selected and visited by our team to ensure maximum comfort. Find at villsy.com your villa with pool for your holiday in Pula! Getting to Pula is very easy and cheap. Since Pula has an airport, you can quickly reach the city by plane. Suburb is also the possibility to take a rental car, so you can explore the area on your own. By car you are also very good on the road: From Munich you drive by car about six hours to Pula. Here one must note that one examines the travel documents before the ride and the tolls into account. Not to forget is also the vignette duty and possible fees for motorway tunnel. Ideally one drives from Germany over Austria and Slovenia to Croatia. From Nuremberg you drive about eight hours and 30 minutes to Pula at a distance of 780 kilometers. Upon arrival, head to your villa with pool! Enjoy our stay in Croatia with our holiday villas! 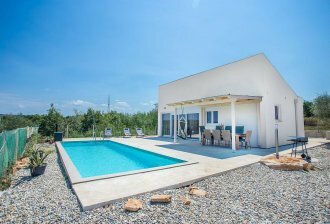 Rent a villa with pool at villsy! There is a lot to see in Pula. A true tourist magnet is the amphitheater, also known as the Arena of Pula. It is one of the sixth largest arena in the world. During the time of the Romans and the Middle Ages many battles were fought here. Today, numerous concerts and events take place in the arena. Another highlight is the triumphal arch, also called the "Golden Gate". Some time ago, the city gate of Porta Aurea stood here, which was completely destroyed in the 19th century. The triumphal arch, in turn, has survived to this day and shines in full splendor as a link between the old town and the shopping area. If you go a little further you will find the temple of August and the forum place. This was named after the then Emperor Augustus. For those who like to travel in the evening, be sure to visit the cranes at the port of the shipyard Uljanik at dusk! Here, a fantastic play of light takes place - as soon as it is dark, the cranes shine in different colors. Behind this breathtaking work of art is the artist Dean Skira. So that you are well accommodated after an eventful day, you can rent at villsy a villa with pool in Pula! Relax fully in our holiday villas in Pula! Pula is an excellent starting point for road trips. From here you can make a detour along the Croatian coast to Zadar, Split and Dubrovnik. Sports enthusiasts are challenged in Pula. In good weather you can experience a lot of action in and around Pula. Especially in Pula and Medulin you can enjoy wonderful diving and windsurfing. If you like it a bit turbulent, you can also plan an afternoon on the go-cart track Green Garden - on an area of ​​3500m² you can really let off steam. Culinary Pula also has much to offer. If you want to eat well and cheaply, you can visit Kod Kadre in Pula. Fresh fish and fresh seafood can be found in the Konoba Batelina. Here, the price is accordingly higher. Those who like to drink wine and enjoy delicious local snacks are in good hands at the BOCA bar. A small but fine selection of Mediterranean food can be found in the Valli Delicious Authentic Food and Bar. There are also many different hiking and cycling trails around Pula, where you can admire the breathtaking nature of Istria. Here you should definitely visit the villages Marcana, Premantura, Fazana and Vodnjan. For those who like to ride and hunt Barban is the ideal detour! To explore everything, it makes sense to rent a villa with pool in Pula. Enjoy the beautiful atmosphere of a villa with pool! In our holiday villas you have enough space to come to rest in the evening! 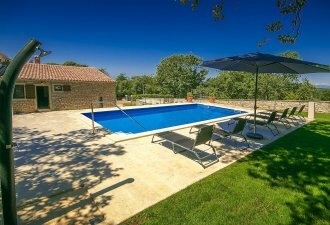 Book with Villsy your villa with pool in Pula! We have the right holiday villas for your holiday in Croatia! On our website you will find hand-picked villas, which were visited and appraised by our team ! With us you can be sure that every villa in Istria offered by us offers you the highest comfort. If you have questions, you can reach us 24 hours a day, seven days a week. We are always there for you with complications and ambiguities! With us you can relax and rent your villa with pool in Istria. You can conveniently book your villa in Istria online. Villsy offers you prime rental vacation rentals so you can enjoy your vacation!